WELCOME TO MARWEN is a 2018 American drama film based off the true story of Mark Hogancamp. The film stars Steve Carell and Leslie Mann and is directed by Robert Zemeckis. Purchase WELCOME TO MARWEN on Blu-ray on April 9, 2019! WELCOME TO MARWEN is a film that is based off the true story of illustrative and photography artist Mark Hogancamp. Mark (Steve Carell) is attacked in a drunken bar fight by five white supremacists when he expresses his fetish of women’s shoes. After the attack Mark has to find a different way to express his art due to memory loss and PTSD. He starts taking photos of dolls that live in a World War 2 time era living in the created German city of Marwen. Mark has created a model city based in German called Marwen during World War 2 era to help him cope with life after the attack and the ptsd. The dolls all correspond to the people he knows in real life. The doll based off Mark is an American pilot that also has a fetish with women’s shoes. Mark meets his new neighbor named Nicol (Leslie Mann) and begins to fall in love his her in real life and in the created city of Marwen. 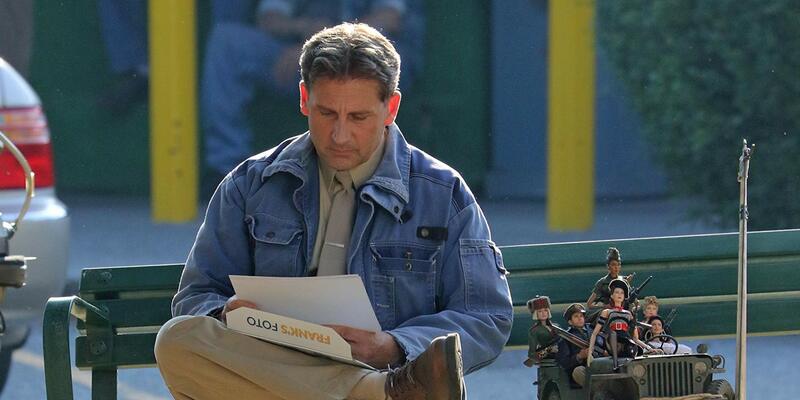 Unfortunately, not everything that happens in Marwen can happen in real life. Mark is constantly trying to live the life he truly wants to live within his created city of Marwen. Overall, I feel like Steve Carell did a great job playing this character. Leslie Mann was a good co-star but I feel like the story about her relationship with her ex was sort of pointless and Mark wanting to explore a relationship with Roberta should have happened a little earlier in the film. I am also not sure if the prescription drug use by Mark was helping or effecting his PTSD from getting better. 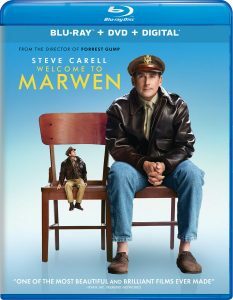 The video is a 1080p quality on the blu-ray for WELCOME TO MARWEN. I was really impressed when I saw the dolls scenes throughout the movie. The likeness of the actors and the movements we spot on. I caught myself more interested in the dolls scenes because of how great the dolls looked. The colors of the dolls and city of Marwen were also really well-done, the designers paid close attention to the small details for the film. Watching the action scenes and movements of the dolls made me believe this was an actual war movie at times. The audio is DTS-HD 5.1 Master Audio and it is great for this style of movie. The movie has some World War 2 scenes throughout the movie so when the planes and gunfire happen on screen you can defiantly hear the intensity of the war action. Then when the movie has the real life scenes the sound is crisp and clear when the dialogue is happening. Michael Madison reviews BATTLE OF THE SEXES on Blu-ray from 20th Century Fox.